Cajun pork meatballs served over rice with sauce piquant. Laissez les bon temps rouler! Mix all the spice blend ingredients together. Put in a tightly closed container. Heat the butter and olive oil in a large pan over medium heat. Add the onion, peppers, celery and garlic to the pan and sweat them, stirring occasionally for 7 - 10 minutes until softened but not browned. Add spice blend, salt, and tomato paste. Stir while cooking for another two minutes. Add diced tomatoes and chicken stock. Increase heat to medium-high. Bring to a moderate boil. Let bubble for ten minutes, stirring occasionally. Meanwhile, make the meatballs. Combine all the meatball ingredients in a bowl, mixing thoroughly by hand for a couple minutes. Form the meatballs, making 12 - 15 total that are between the size of a ping pong ball and a golf ball. After the sauce has boiled for about ten minutes, the sauce should be slightly thickened. Reduce the heat to medium-low. Sprinkle the green onions over the top of the sauce. Nestle the meatballs into the sauce. The top of the meatballs may be out of the sauce; this is fine. Cover. (If you are making rice, start it now.) Simmer for about ten minutes. Take the cover off. Turn the heat up to medium-high and return the sauce to a boil. 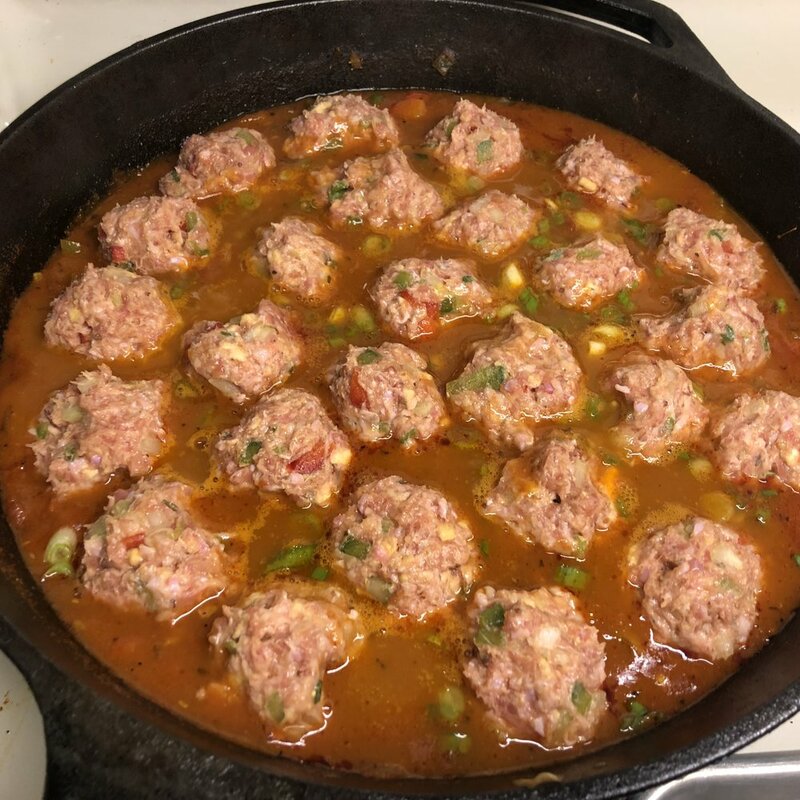 Roll the meatballs in the sauce, stirring gently, allowing the sauce to thicken to desired consistency, about five to ten minutes. Serve over rice. Garnish with parsley. The base of flavor for Cajun and Creole cooking is the “holy trinity” of green peppers, onions, and celery. 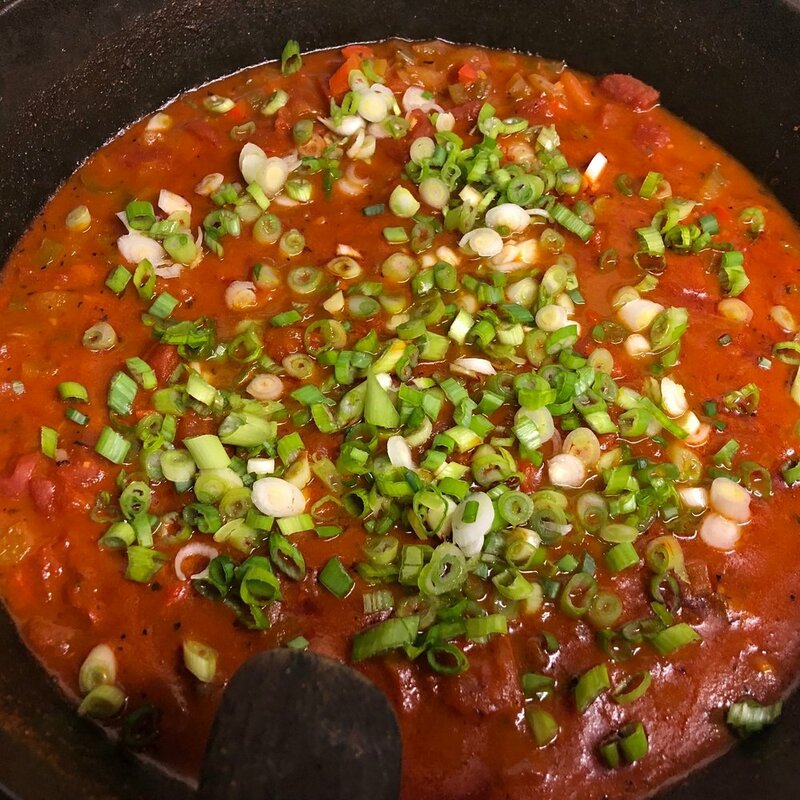 Whether you call it Creole sauce, red gravy, or sauce piquant, it’s made from tomatoes, trinity, and spices. For the best texture, don’t overwork the meat mixture. Don’t bother to brown the meatballs. Cooking them in the sauce instead actually improves their taste and texture because they absorb more of the flavor of the sauce and are more tender. Simmer the meatballs in the sauce until they are fully cooked and the sauce is slightly thickened. Serve the sauce and meatballs on rice and garnish with fresh parsley. Delicious!